Successful scientific research is rarely a one-person endeavor, particularly when the research is interdisciplinary in nature, or requires field or laboratory investigations in multiple environments. The collaborative nature of modern ocean science research is evident in a recent publication in Science Advances, the peer-reviewed scientific journal published by the American Association for the Advancement of Science. 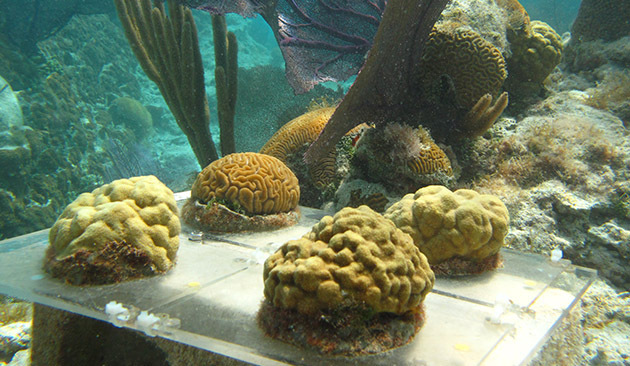 The paper, “Environmental controls on modern scleractinian coral and reef-scale calcification,” represents the efforts of 11 researchers from six research institutions over a six-year period. Through their collaboration, they uncovered new evidence that shines light on how reef-building corals respond to environmental variables associated with a changing global climate. “It took many days of boat, diving, and lab work to create these data sets, and it is extremely gratifying to see the conclusions and how they expand our knowledge of how coral reefs respond to [changing] environmental parameters,” said Samantha de Putron, a marine biologist and ecologist and one of six BIOS researchers who worked on the study. Others at BIOS included Nicholas Bates, Andrew Collins (now with the NOAA Pacific Marine Environmental Laboratory), Rebecca Garley, Rod Johnson, and Tim Noyes. International collaborators came from the Scripps Institution of Oceanography in California, GEOMAR Helmholtz Center for Ocean Research and Christian-Albrechts-University Kiel in Germany, and the University of Southampton in the U.K.
A BIOS research boat is moored off a National Oceanographic and Atmospheric Administration (NOAA) Pacific Marine Environmental Laboratory (PMEL) buoy outfitted with sensors that measure carbon dioxide concentrations in the water column. For this study, two buoys were moored in Bermuda, one at Hog Reef and one at Crescent Reef, in order to obtain measurements from two different reef environments. Calcification—the fundamental process of reef building, where coral organisms remove carbonate ions from the water and deposit them as calcium carbonate coral skeletons—is impacted by numerous factors. Laboratory-based experiments have indicated that temperature, light levels, pH (an expression of acidity), and nutrient availability are among the most influential. However, few studies have been conducted with in-situ observations (measurements made in the field with naturally occurring conditions, as opposed to controlled laboratory conditions). This makes it difficult to explore the combined effects of environmental factors on calcification. Over a two-year period, from 2010 to 2012, researchers used a variety of buoys, sensors, and in-situ measurements of coral growth to study two distinct reef environments in Bermuda. Armed with a vast amount of data, they then employed detailed modeling (known as Structural Equation Modeling, or SEM) to investigate both the individual impacts and the combined—or interactive—effects of environmental variables on the calcification rates of corals in the marine environment. Despite the paper’s authors being separated by many miles, and in some cases an entire ocean, a clear-cut division of labor helped ensure a seamless collaboration. 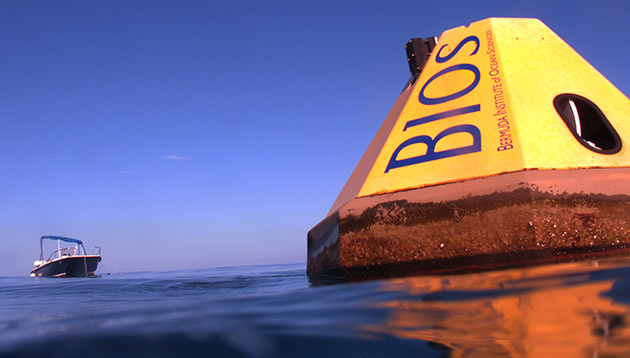 Andreas Andersson, a chemical oceanographer with Scripps Institution of Oceanography and adjunct faculty member at BIOS, has served as the project lead since working at BIOS from 2007 to 2011. During that time, he was principal investigator, along with co-principal investigators Bates and de Putron, on the original grant that began the project: the Bermuda Ocean Acidification and Coral Reef Investigation (better known as BEACON). Andersson, along with Collins, de Putron, Garley, Noyes, and multiple interns over the years, collected the core of the data used in the manuscript, with additional data from the Bermuda Atlantic Time-series Study contributed by Bates and Johnson. The study’s results suggest that, at least in Bermuda, coral calcification is influenced more by temperature than by other factors, such as pH. But graduate student Travis Courtney, who works with Andersson, places a stipulation on this. He points out that if warming is too excessive or occurs too fast, the corals reach a tipping point at which growth stops and bleaching occurs.